AUD 3,087 Excl. Duties / Taxes. This Marquise diamond is 0.82 carat in weight, and comes with Very Good polish and Very Good symmetry, as verified from an independent gemological laboratory. The diamond is graded I in colour, and has a clarity grade of VVS1. The diamond's IGI grading report number is 314824993, which will detail further its specifications and measurements, and will also come with the purchase of the stone. AUD 1,062 Excl. Duties / Taxes. This Marquise diamond is 0.4 carat in weight, and comes with Very Good polish and Very Good symmetry, as verified from an independent gemological laboratory. The diamond is graded L in colour, and has a clarity grade of VVS1. The diamond's GIA grading report number is 1303034680, which will detail further its specifications and measurements, and will also come with the purchase of the stone. AUD 1,209 Excl. Duties / Taxes. This Marquise diamond is 0.31 carat in weight, and comes with Very Good polish and Very Good symmetry, as verified from an independent gemological laboratory. The diamond is graded F in colour, and has a clarity grade of VVS1. The diamond's GIA grading report number is 6285795493, which will detail further its specifications and measurements, and will also come with the purchase of the stone. This Marquise diamond is 0.56 carat in weight, and comes with Excellent polish and Very Good symmetry, as verified from an independent gemological laboratory. The diamond is graded D in colour, and has a clarity grade of VVS1. The diamond's GIA grading report number is 5172524169, which will detail further its specifications and measurements, and will also come with the purchase of the stone. AUD 12,233 Excl. Duties / Taxes. This Marquise diamond is 1 carat in weight, and comes with Good polish and Good symmetry, as verified from an independent gemological laboratory. The diamond is graded D in colour, and has a clarity grade of VVS1. The diamond's GIA grading report number is 2151184372, which will detail further its specifications and measurements, and will also come with the purchase of the stone. AUD 41,226 Excl. Duties / Taxes. 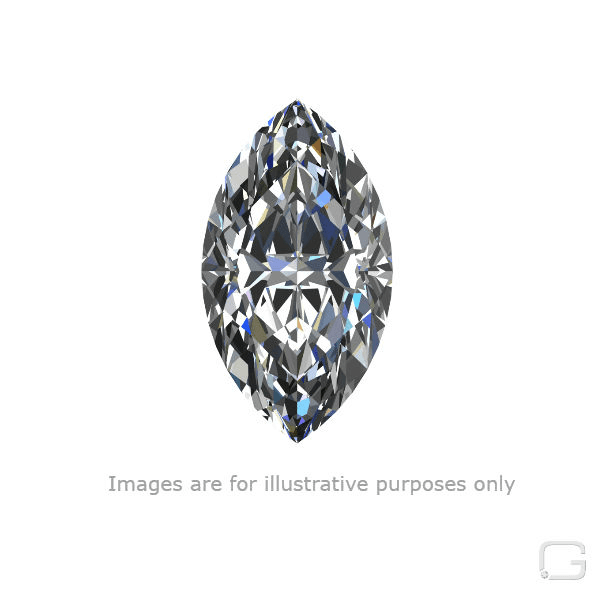 This Marquise diamond is 2.01 carat in weight, and comes with Excellent polish and Very Good symmetry, as verified from an independent gemological laboratory. The diamond is graded D in colour, and has a clarity grade of VVS1. The diamond's GIA grading report number is 2195462511, which will detail further its specifications and measurements, and will also come with the purchase of the stone. AUD 4,543 Excl. Duties / Taxes. This Marquise diamond is 0.81 carat in weight, and comes with Excellent polish and Very Good symmetry, as verified from an independent gemological laboratory. The diamond is graded F in colour, and has a clarity grade of VVS1. The diamond's GIA grading report number is 2277564801, which will detail further its specifications and measurements, and will also come with the purchase of the stone. AUD 9,376 Excl. Duties / Taxes. This Marquise diamond is 1.08 carat in weight, and comes with Very Good polish and Very Good symmetry, as verified from an independent gemological laboratory. The diamond is graded D in colour, and has a clarity grade of VVS1. The diamond's GIA grading report number is 6301924252, which will detail further its specifications and measurements, and will also come with the purchase of the stone. This Marquise diamond is 0.44 carat in weight, and comes with Very Good polish and Very Good symmetry, as verified from an independent gemological laboratory. The diamond is graded D in colour, and has a clarity grade of VVS1. The diamond's GIA grading report number is 1298570703, which will detail further its specifications and measurements, and will also come with the purchase of the stone. This Marquise diamond is 0.31 carat in weight, and comes with Very Good polish and Very Good symmetry, as verified from an independent gemological laboratory. The diamond is graded F in colour, and has a clarity grade of VVS1. The diamond's GIA grading report number is 5303075424, which will detail further its specifications and measurements, and will also come with the purchase of the stone. AUD 2,270 Excl. Duties / Taxes.